Christmas pudding is a dessert traditionally served on Christmas day in Britain, Ireland and some Commonwealth countries. It is sometimes known as "plum pudding", but this name can also refer to some other kinds of pudding which are also based on dried fruit. Christmas pudding is made with dried fruit and nuts, together with suet (beef or mutton animal fat), and then steamed. It is very dark, almost black, and usually moist with brandy or other alcoholic beverages. Of course, nowadays it is possible to buy or make Christmas puddings using only vegetable fats (and suitable for vegetarians), or Christmas puddings that do not contain alcohol (for those who do not consume alcoholic drinks). Christmas puddings were traditionally prepared five weeks before Christmas, most frequently on the Sunday of the week before the start of Advent (which is sometimes known as "Stir-up Sunday"). However, as Christmas puddings keep extremely well for a long period of time (months, or sometimes even a year or more), many families like to put aside an extra pudding, to be eaten later in the year (for example at Easter). Some families even go so far as to make their Christmas pudding a whole year before the Christmas at which they intend to eat it! Of course, not everybody makes their own Christmas pudding themselves nowadays - you can buy ready-made puddings in all major supermarkets - and all you have to do with these is simply heat them up. Many supermarket Christmas puddings simply need to be heated in a microwave oven - which of course makes it really easy to prepare them. Traditionally a small silver coin (such as a sixpence) was placed in the pudding, and could be kept by the person whose serving included it. The idea was that coin would hopefully bring wealth for the coming year to that person. Other tokens such as a silver thimble (for thrift), an anchor (for safe harbor) or a tiny wishbone (for luck) have also sometimes been included in Christmas puddings, and again, whoever received the particular token would hopefully also receive the associated benefit in the coming year. Christmas pudding is traditionally decorated with holly, and may be doused in brandy and set on fire ("fired"). 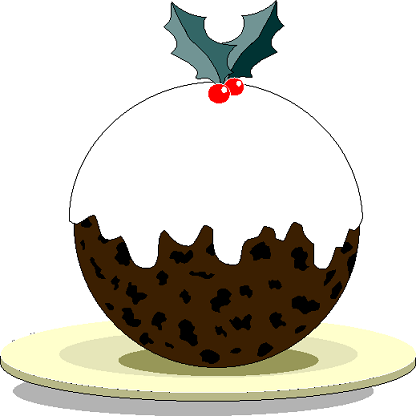 Christmas puddings are usually eaten with brandy butter, cream, custard or other similar sauces.